Artist's Comments: The collector selected this scene after moving into a new house and finding that he really missed the majestic mountain view he enjoyed from his old property. When we met, he described some key features which were important to the allure of this scene; first of course, the grander of the mountain, the vibrancy of the change in color between the upper and lower regions; a memory of a full moon rise visible at dusk just over one of the Pu'u; a river full with rain run off cutting its way thru the soft red cinder cones, the rolling fairways of the 12 hole on the Kaunaoa Course, thorny Kiawe trees and a herd of wild goats traversing thru the course - no golf course on the Big Island would be complete without them! This new project presented me with a unique challenge; to capture the grand scale and detail of the Kohala mountains on a seemingly limited canvas. Because I had never painted a mountain range as the focal point, I spent allot of time studying the mountain at different times of day and during different seasonal changes. At this time, The Big Island was enjoying a very wet Spring so the mountain was bathed in a stunning green blanket which contrasted beautifully with the dry, rust colored hills in the lower slopes. 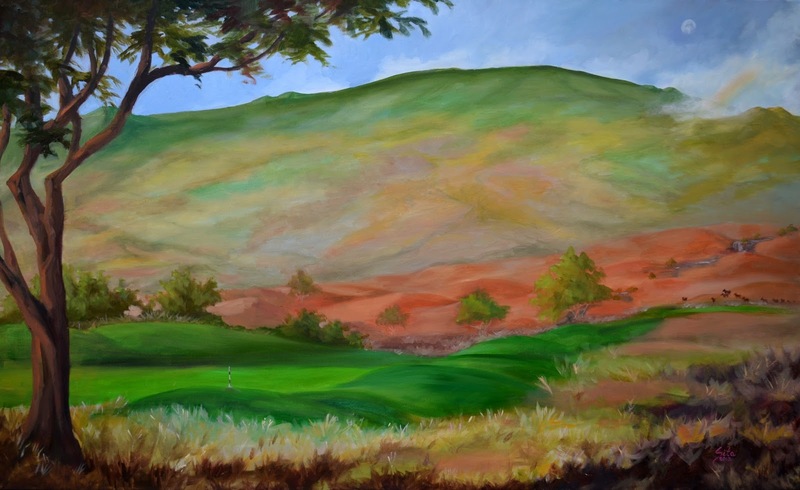 As I sketched the scene I quickly realized that I had to make a choice; if I tried to paint the entire mountain from the Waimea slopes to Kawaihae, the mountain would appear further away in the distance and would lose some of its detail. 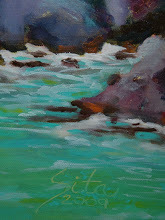 So I decided to paint the middle section of the mountain which allowed me to reflect the closeness and grandeur. I accentuated the angle of the lower hills in the foreground to communicate the change in elevation as the hills slope down to the shoreline. Another area that tested my skills were the rainbow. Since the client wanted the river to be flowing with rain run-off I felt it necessary to suggest that rain clouds were present on the Kohala slopes and a rainbow was the perfect way to convey the presence of rain. When trying to paint the rainbow, it first appeared like a child's rainbow as if it didn't belong in the scene. I tried to research online to find any tricks to rendering a realistic rainbow but could not locate any tips. Then one day, I saw a rainbow and realized that instead of trying to paint color on top of cloud, I needed to paint the color of the rainbow in the same value as the clouds - as if the rainbow was sitting within the cloud. Armed with that concept I perfected the rainbow so that it is just a hint of color within the clouds. After the trials and challenges I am really happy with the result. 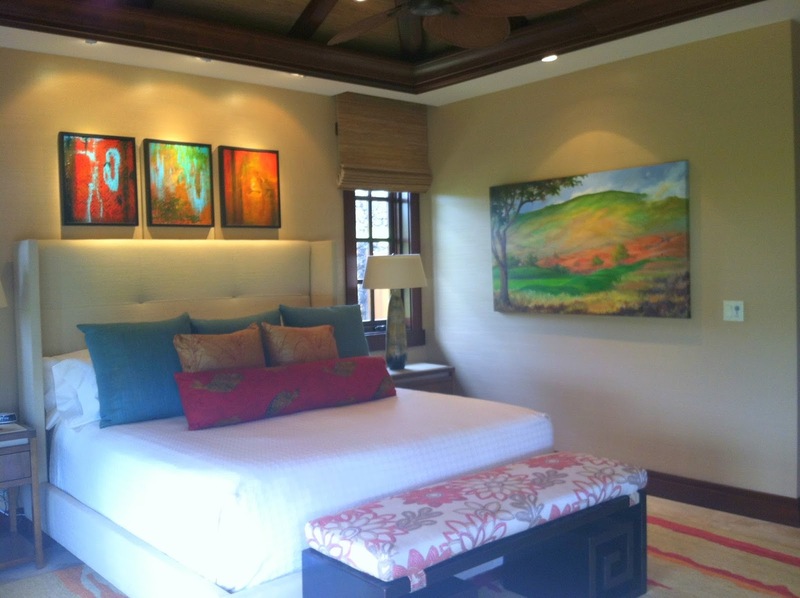 The colors compliment the master bedroom wonderfully and I feel all the requested elements for the collector were rendered well.